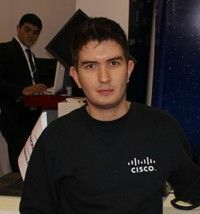 - At Bakutel we are representing Bakinity, a partner of Cisco. The thematic areas of the exhibition are useful to us, and it has been organized to an appropriate standard. Our stand broadly informs visitors about our company’s products: we are offering the opportunity for visitors to learn about our solutions and services, our servers and network equipment. In particular, one of our most popular projects is a videoconferencing program for communication regardless of geographical location. The solution provides a full HD-quality video stream through a secure network which is virtually impossible to crack. Interest in this equipment is strong in all sectors. Previously people spent money on ICT solutions, without paying much attention to the appropriateness of these costs. However, people have now become interested in specific solutions and are ready to make investments in order to save time. This is the future in this field.